At the end of the 19thC there was a massive expansion of London’s mid-Victorian rail network. With land prices in the Capital at a premium and demolition of building stock hugely disruptive and difficult, increasingly rail development took place underground, only to rise to the surface again as the ‘tube’ lines entered the suburbs. 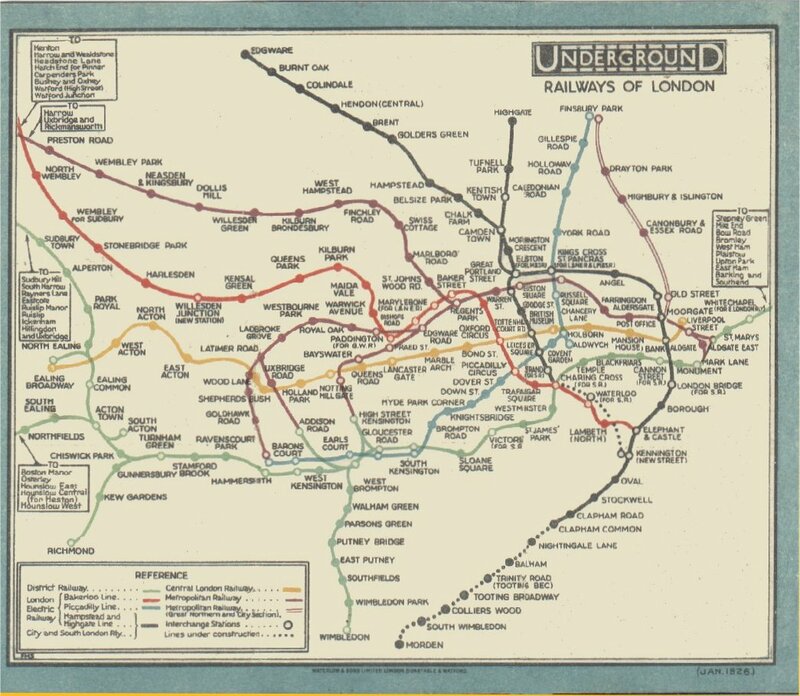 Both London residents and visitors needed a means of making sense of, and navigating, this increasingly complex overground and underground rail network. The maps created in the first half of the 20th C provide a marvelous expression of problem solving ie. how to design a map that worked, that could make complexity simple. 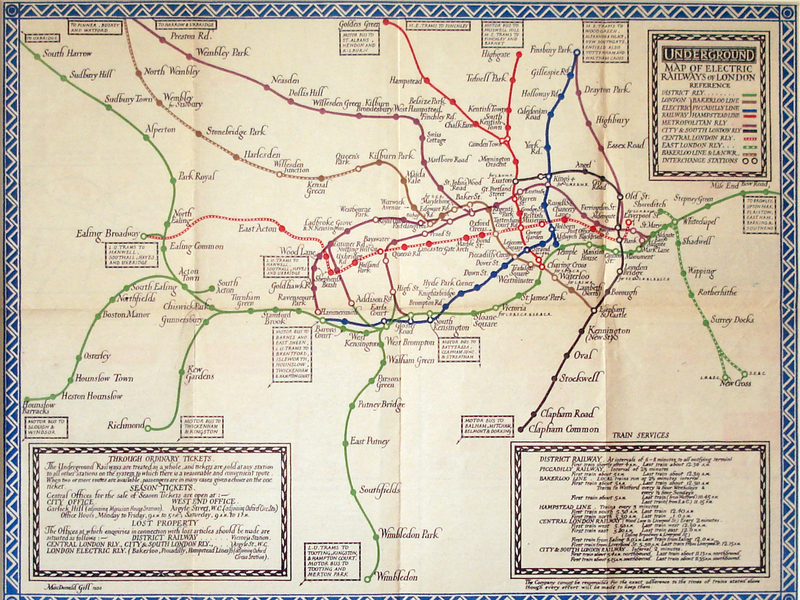 The ‘District’ Railways Map of 1907 shows that it was originally thought that the issue could be solved by simply overlaying the underground system on an overground map, fine in the outskirts of the city, but where numerous lines converged it created near-unreadable ‘spiders-webs’ of coloured lines. 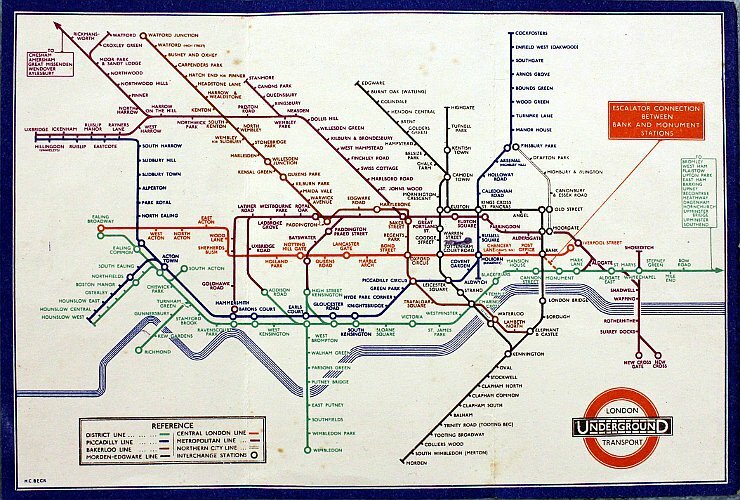 The distances between stations was shown to scale and the relationship between overground and underground remained inextricably linked. 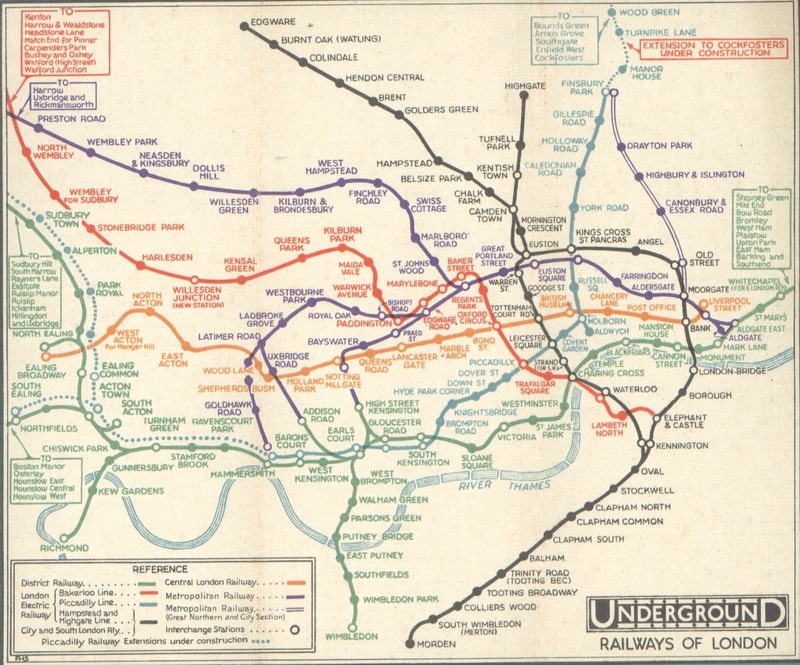 This 1908 Map shows some critical developments in that it now focuses solely on the ‘tube’ network and colour-coding has been introduced to help identify one line from another. However, every station is still spaced to geographic scale, resulting in a cluster of dots around central London, with just a sprinkling near the city’s outskirts. 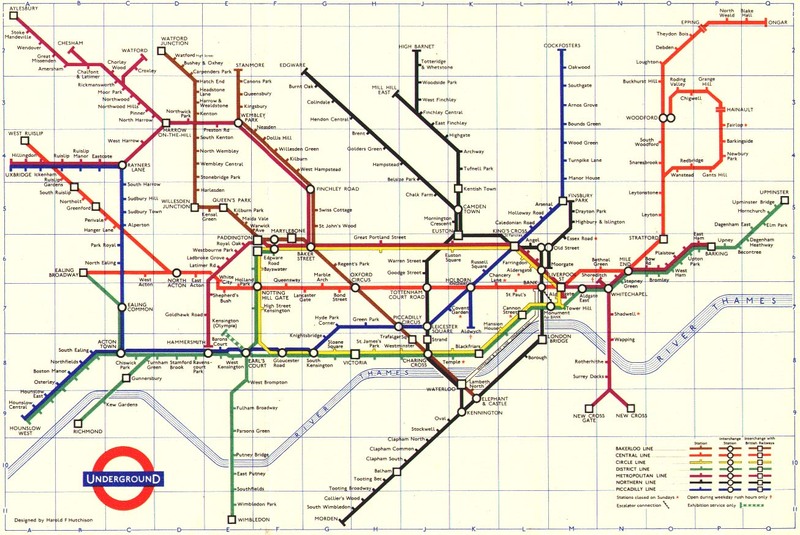 Interchanges weren’t clearly rendered, and every tube line was represented with a curve showing its true path, with above-ground streets and intersections imposed on top. For a bird with x-ray vision, it would have been a remarkably faithful representation. For commuters, it remained confusing. 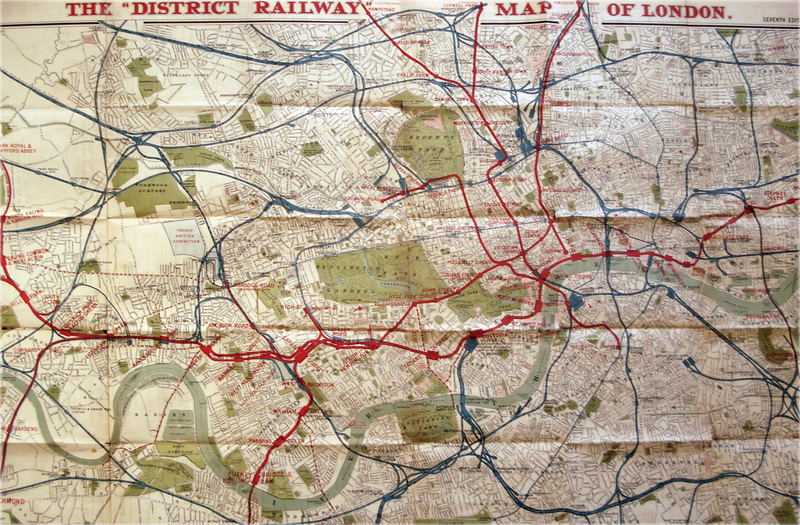 This 1920’s map is one of the very first examples of an attempted ‘artistic’ style of map. 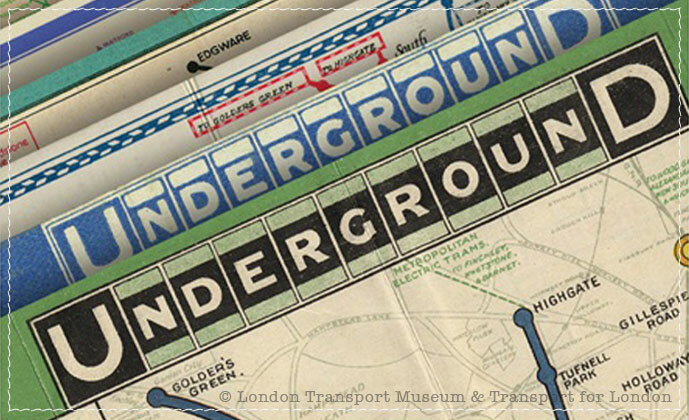 Its design is attributed to MacDonald ‘Max’ Gill who was taught calligraphy by Edward Johnston, the designer of the Underground’s eponymous Johnston typeface. 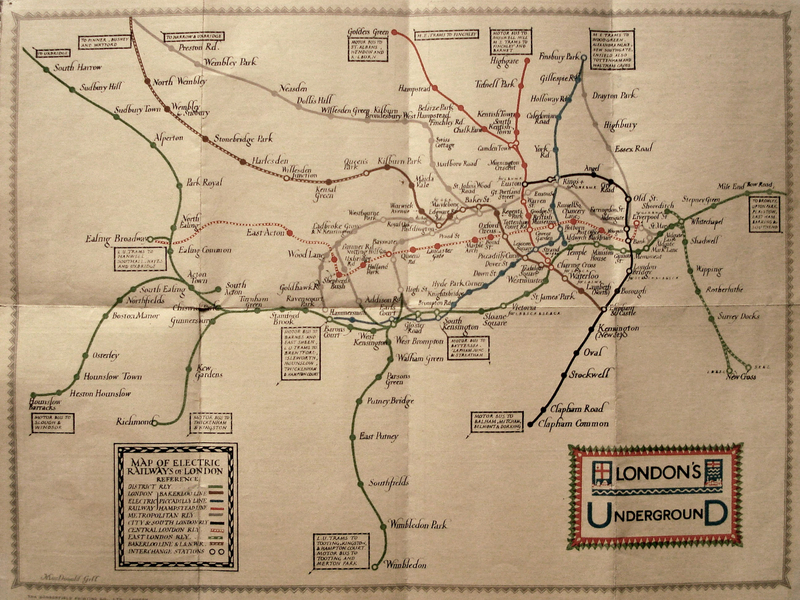 MacDonald, was more of an artist than a technician and by his creative and artistic skills, using a decorative border, calligraphy for the names of the stations and other text, he produced an attractive and very individual style that made a major new step towards simplifying the understanding of the underground network. Critically he did away with all of the background detail that had been included in most of the previous designs; however the essentially ‘geographical’ layout of the map remained. There were a number of slight variations on what was essentially the same MacDonald ‘Max’ Gill map, as this 1922 version shows. This 1926 map is one of the first of eleven editions of the Fred.H. 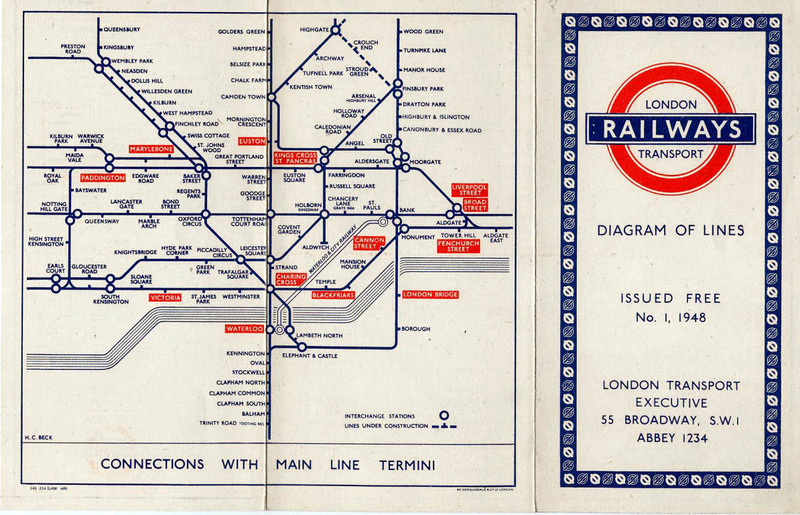 Stingemore’s maps that were produced between 1925 and 1932. The designer’s initials, FHS, can be read in the bottom left hand corner. Fred Stingemore was a draughtsman for the underground company. His maps were designed in an effort to consolidate the network and make it easier to understand by compressing the outlying lines in comparison to the intricate and congested central area. Although still basically following a geographical layout, in the light of the distortion, we see the removal of all of the ground level detail including the river. One significant change in this map from the first edition is the inclusion of the river, the only ground level feature shown. The legendary Harry Beck produced this radically simple, abstract design in 1933. 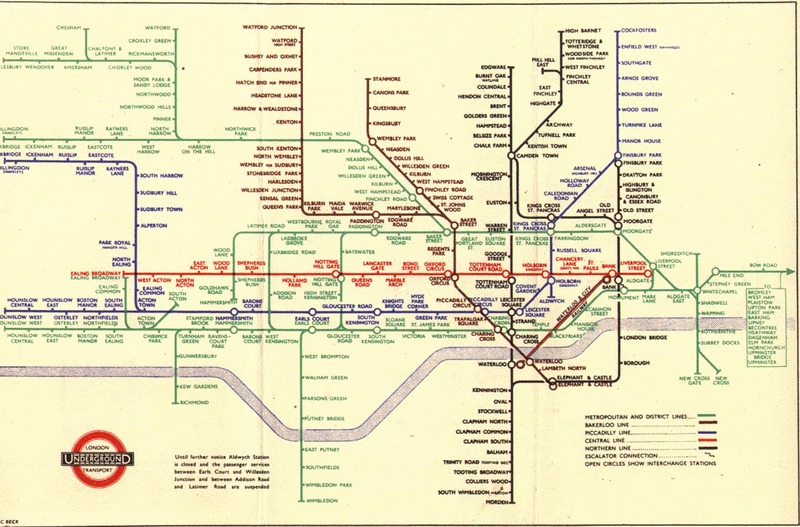 Rather than emphasising distance and geographical accuracy, like other maps, Beck based his on the circuit diagrams he drew for his day job; stripping the sprawling Tube network down to a neat diagram of coloured, criss-crossing lines. 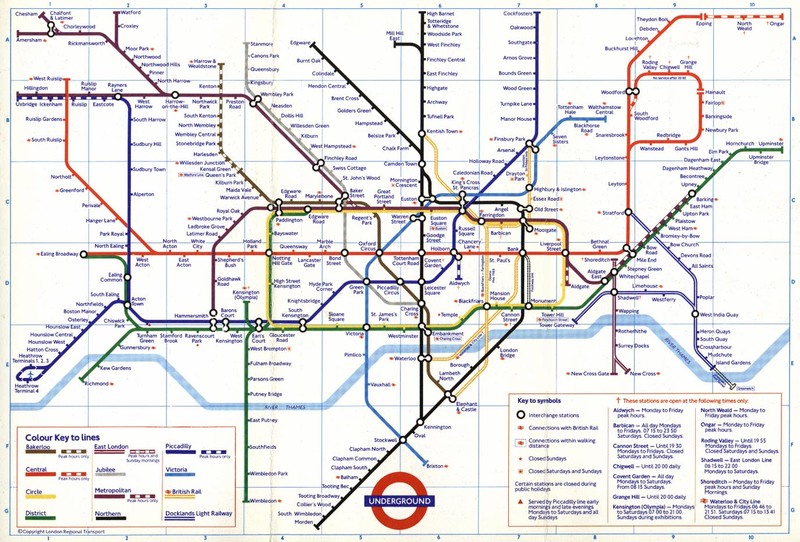 Beck’s map was initially rejected by the publicity department because it was considered too radical but a successful trial print-run showed that it was just what the public wanted. 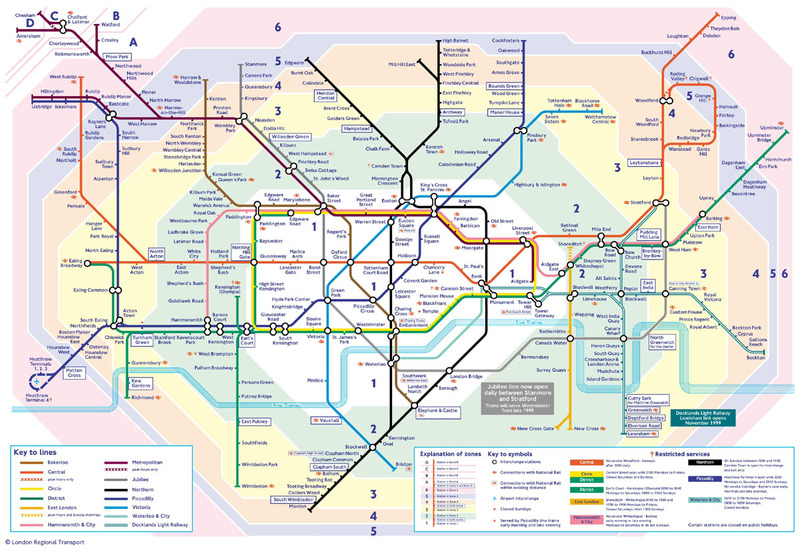 The result was an instantly clear and comprehensible chart that would become an essential guide to London – and a template for transport maps the world over. Beck’s revolutionary design, with certain modifications and additions, survives to the present day and is set to serve London Underground and its millions of customers for many years to come. Beck began by replacing the map’s existing sinuous curves with straight lines — horizontals, verticals, and 45-degree angles. He also skewed its scale, placing the stations at equal distances from one another, and removed the above-ground street grid. The result was a sparse, circuit board-like design that eschewed geographic accuracy for legibility. 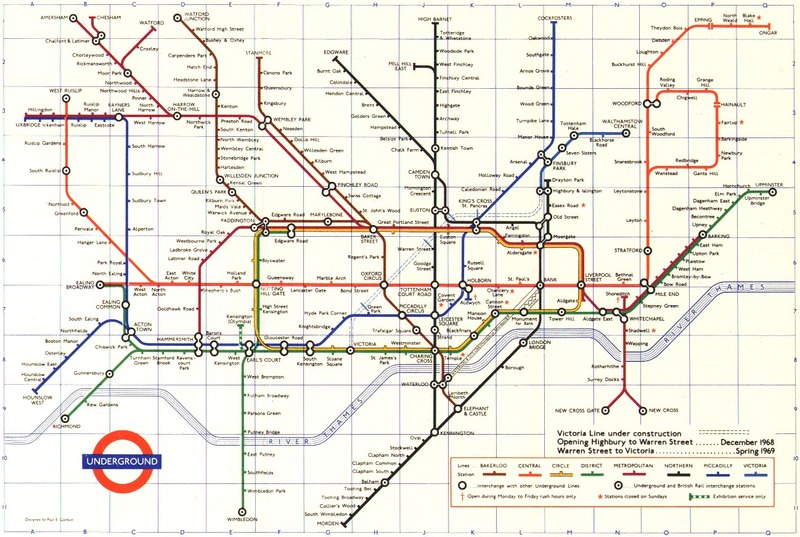 Ken Garland, an English graphic designer and Beck biographer, says the map’s most innovative feature was its “convex lens” that disproportionately enlarged the area around central London. This enlargement carried a more subliminal connotation, as well, insofar as it made London’s outskirts seem close to the city’s commercial hub. 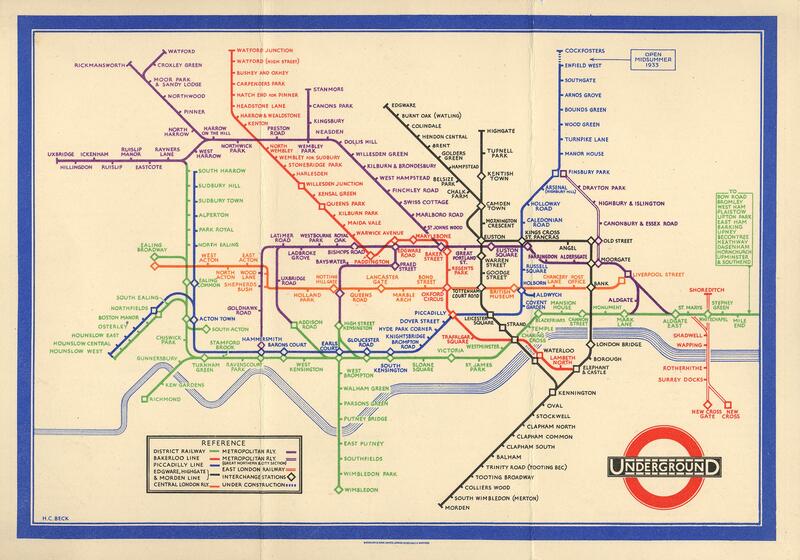 Over the decades a ‘family’ of maps were created, with each using what became established conventions able to be read by Londoners and visitors alike. And if all these variations have left you feeling a little bemused, take a look at this fascinating site (HERE) which usefully morphs the various map designs one into the other.